In this post, we will see how the Resources work and how you can utilise it for your online business. We have so far seen how a service can be booked and availability of it is only effective for that particular service. But with this functionality, you can add a resource to multiple services and share the availability of it among all. This means the availability of resources is global across all bookable products. 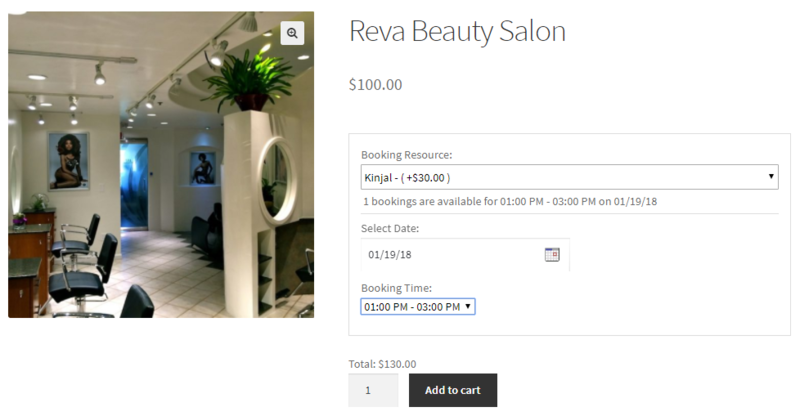 Let’s take an example of a Role, this we refer to as an Expert of a Beauty Salon who can be booked for a specific occasion like birthday or christmas party, for several hours. Also the same resource can provide services for multiple nights for a destination wedding as well. Hence more than one service can be provided by the same resource but not at the same time. Similarly, as an instance for a Product, we would refer to a Party Hall which can be booked for different events at different times. Like the same hall can be booked for birthday parties, corporate events or marriages etc. but not all at the same time. Moving further, for better understanding of how resource functionality can work with different businesses, let us learn about how adding settings and assigning the resources works with 3 booking types that we provide in our plugin. Note: Resources feature will only work with Simple products but not with Variable products. You can add/edit resource from Bookings -> Resources submenu. 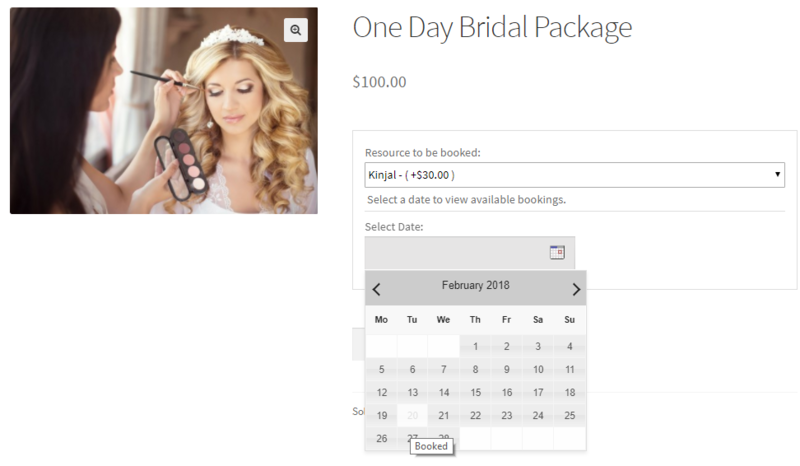 On the Edit Product page, under the Booking meta box, there is an option called Booking Resource. Enabling this option will allow to add the resource to that product. 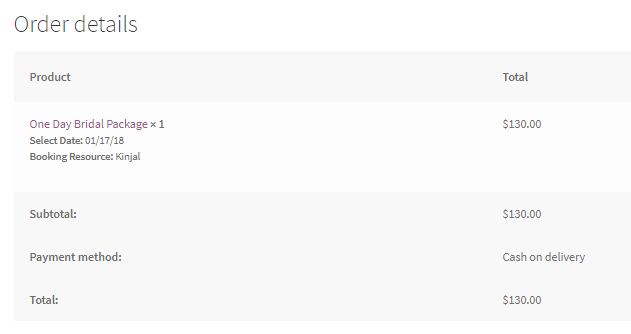 Now let’s see how the Resource can be used for all three booking types we provide in our plugin. Here you can add a resource/person that provides service for the whole day. Depending upon the availability of the resource, maximum bookings can be taken for that day. Here you can add a resource/person that provides service for one or more than one night. The resource can be charged for the entire specified period of booking or on per day basis. Here you can add a resource/person that provides service as per time slots assigned. Services are booked as per availability of the resource. 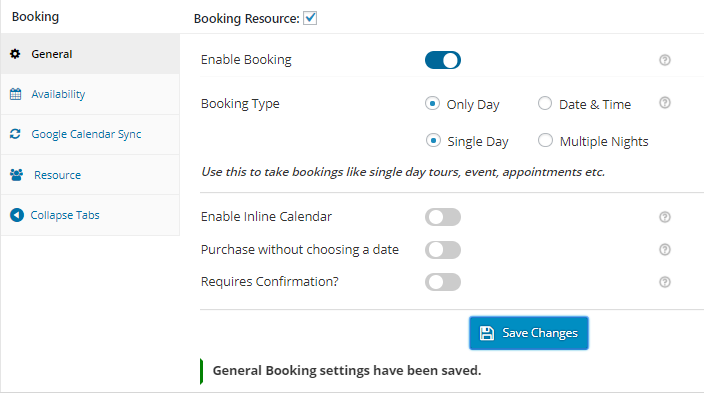 To utilize Resource feature you need to update the Booking plugin to the v4.6.0 and higher version. So now let’s understand how resources can be booked as per availability for each of these instances. 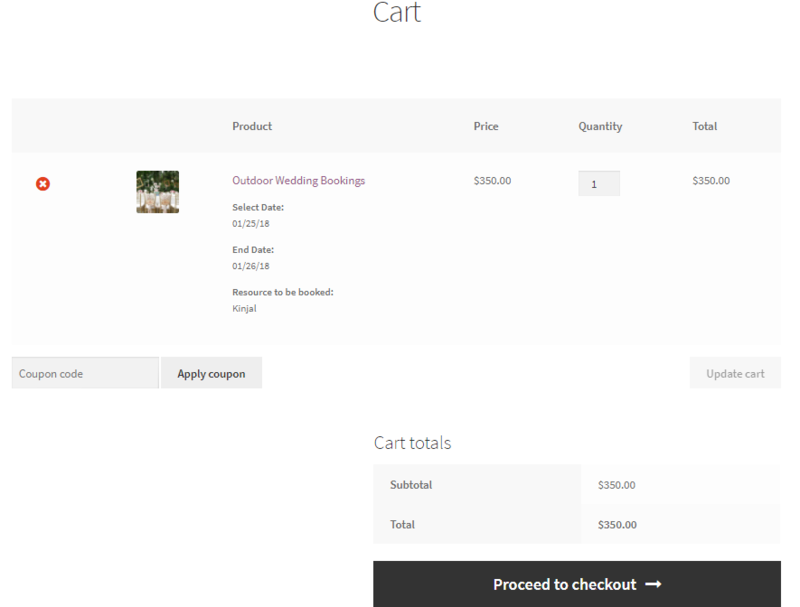 In this instance, we will create a product named One Day Bridal Package. 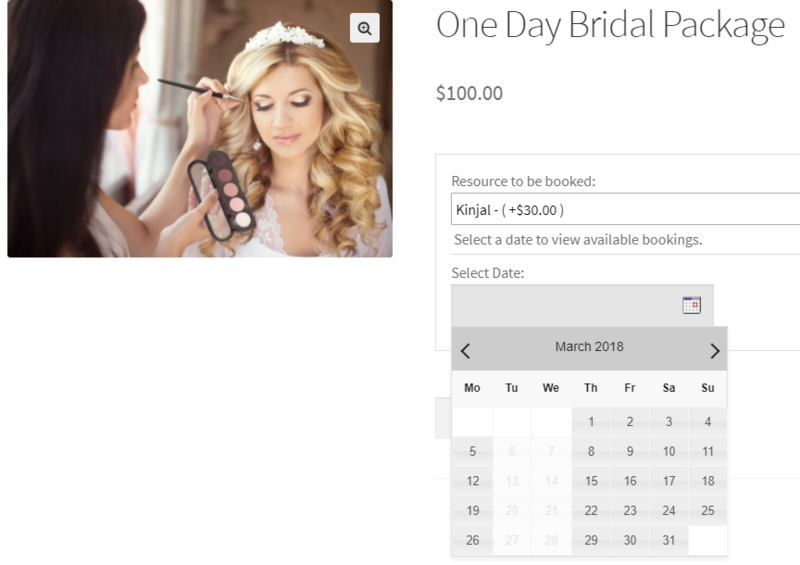 We will enable the Booking option and select Booking Type as Only Day -> Single Day. As we have ticked the Booking Resource checkbox, Resource tab is added to the meta box as shown below. Click on the Save Changes button. Note: Always set maximum bookings greater or same as resource availability because resource availability value will be considered first. 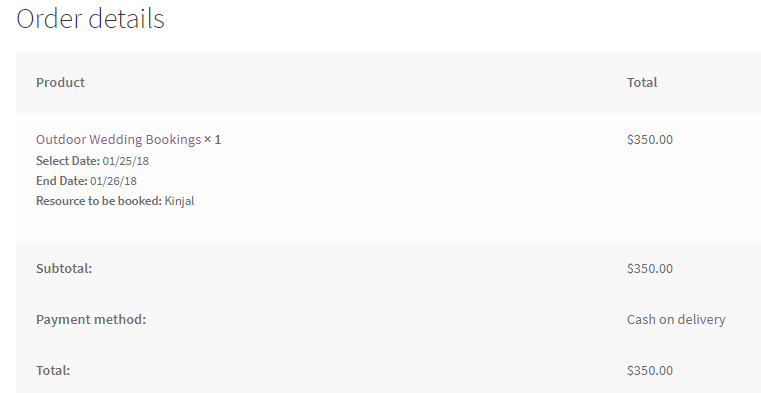 i. Label: You can set the label of resource dropdown that appears on the front end product page. ii. Resource are: You can allow your customer to select the available resource or the resource can automatically get assigned to the service when it is booked. iii. Resource table: Here, you can add an already created resource. Also, you can directly create a new resource and add it to the service. Now go to Resource tab and set the label as Resource to be booked and select Customer Assigned option as resource type. 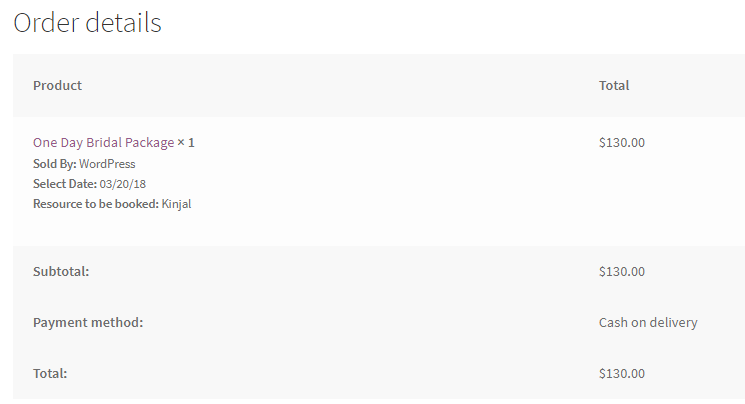 In the Resource table, select Kinjal from the resource dropdown and add it by clicking on Add/Link Resource button. Once added, you can set the resource base price as $30 as shown below. Note: The base cost is an additional amount to be paid from the usual price for this product to the resource. 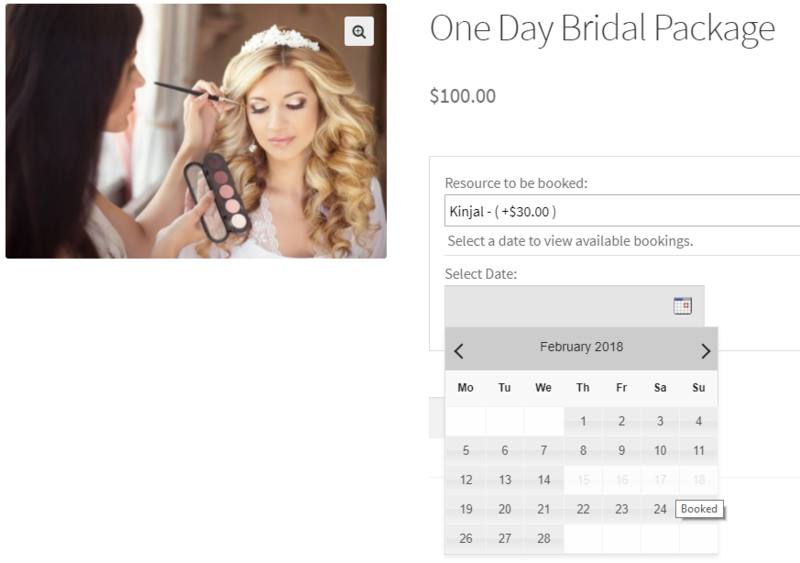 Once you have saved all the booking details, availability settings and resource details, click on the Publish button to make this product live for the customers to book. As you can see, there is a dropdown for selecting the resource because the resources are Customer Assigned in the back end. The selected resource name appears on the product page with its base cost displayed as Kinjal – (+30.00) in the above screenshot. 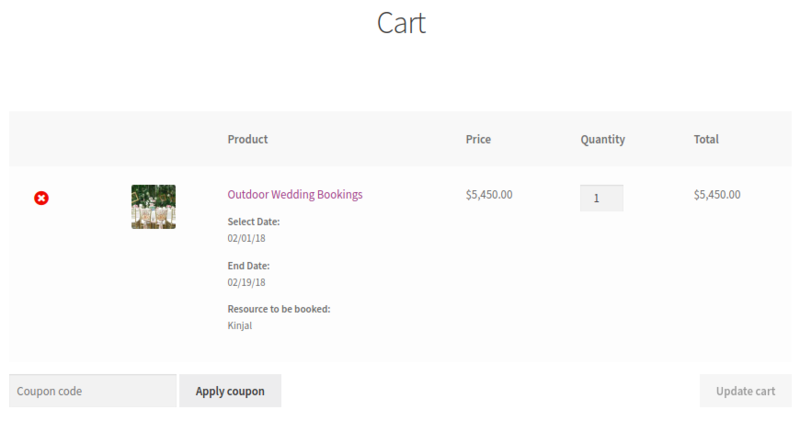 Let us select the date for booking and add the product to cart. 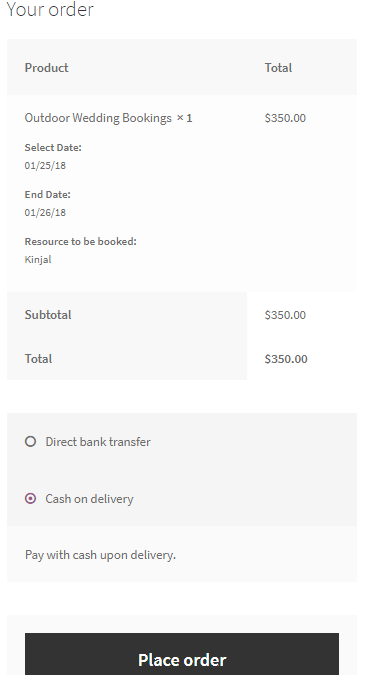 The resource Kinjal is selected for 17th January, 2018 and the total cost for the booking will be $130 as the Regular Price is $100 and Kinjal’s additional charge (eg. conveyance etc) for the service is $30. As you can see, 1 bookings are available on 01/17/18 message is being displayed for selected booking date. This is because Kinjal’s availability is set to 1 in the Booking-> Resources-> Kinjal-> Available Quantity option in Resource details meta box. 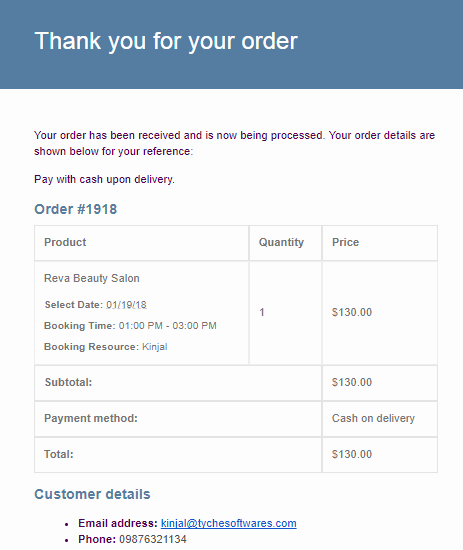 If you see, the booking and resource details are displayed under the product name. 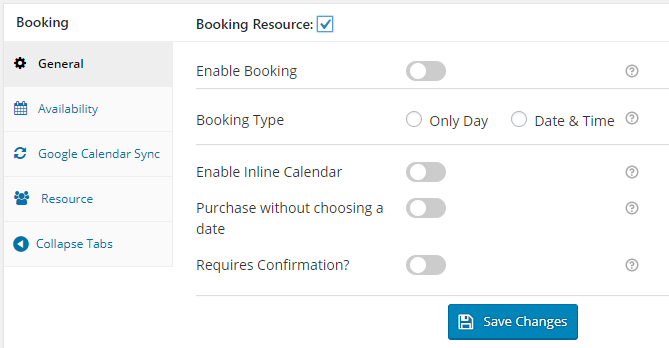 This is how we can assign a resource to a single day product for booking service for the selected date. On similar terms, let us book service for multiple night product and assign the same resource to it. Since this is a multiple night product, you can also add Fixed Block Booking and Price By Range Of Nights feature along with Resource feature. 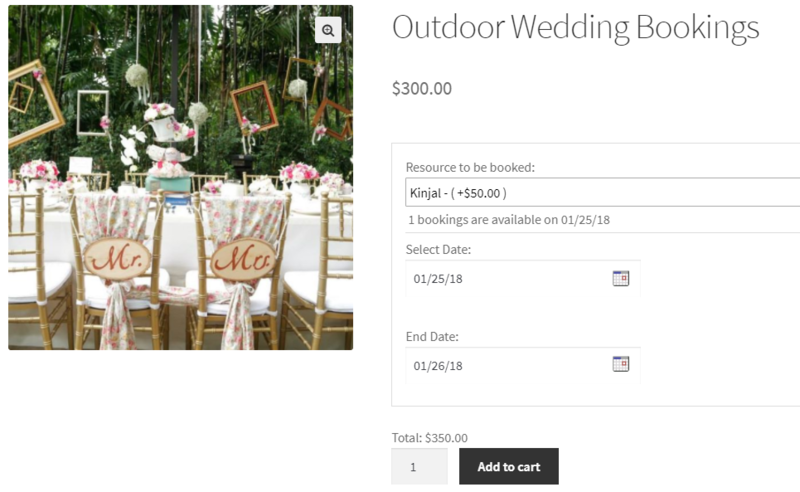 Here we have selected Kinjal for Outdoor Wedding Booking from 25th January to 26th January, 2018 and the cost for this service booked is $350, where the additional resource charge of $50 is added in the total. 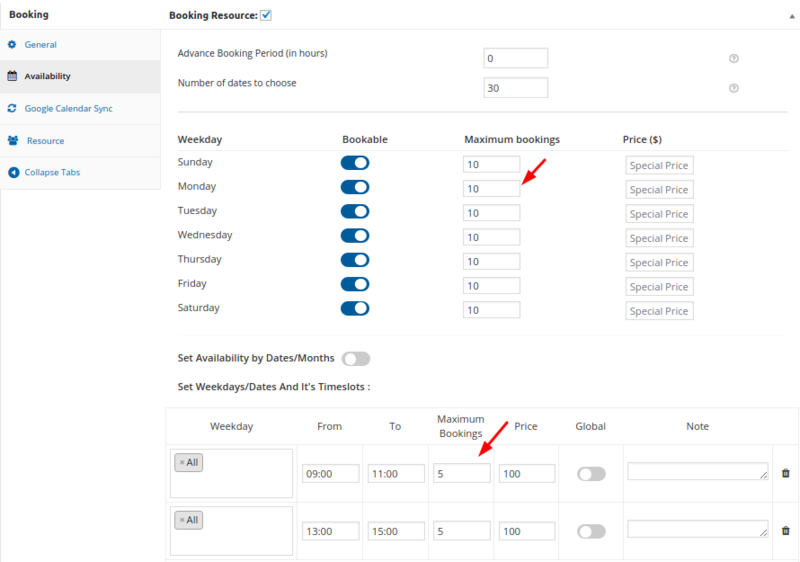 This is how we can assign a resource to multiple night product for booking services for the selected dates. According to this setting, the resource’s cost will be multiplied with the number of days booked and the total price will be calculated. Now we shall discuss how to add resource to a booking which is based on time slots. 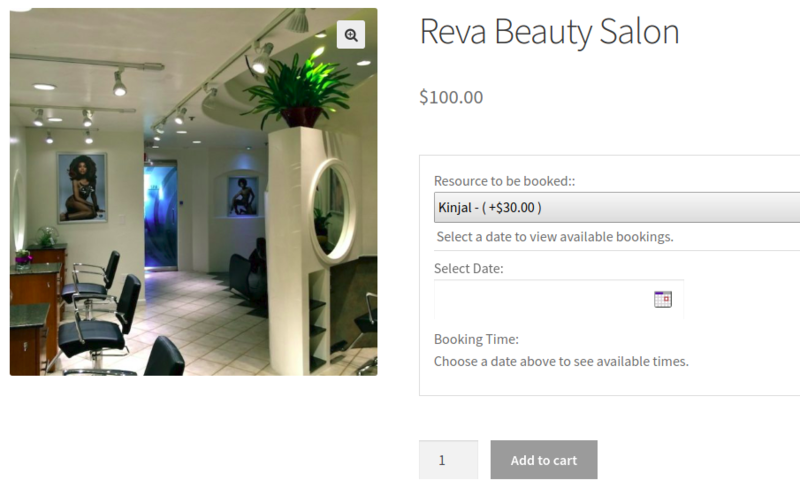 For this we will first make a bookable product named Reva Beauty Salon and add its regular price. Let us now add the resource from the Resource tab, like we did in the previous 2 examples. Here again will add same Kinjal as the resource and add her base cost as $30. 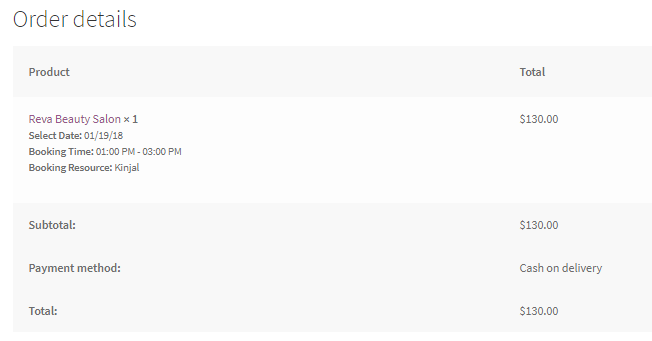 Finally the product with the selected timeslot has been booked. Now heading towards the main part where validations apply. This means as per the functionality of the plugin, one resource can provide different services but not at the same time. 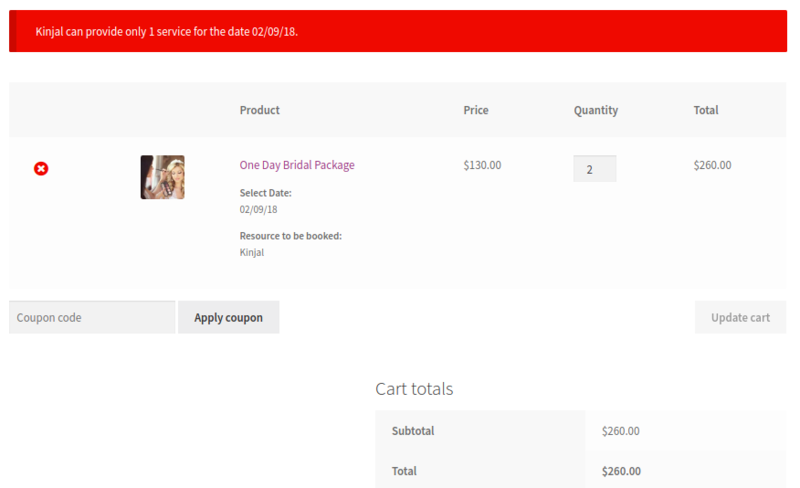 We have added Resource – Kinjal to all 3 examples explained above, let us see how her availability appears on the booking calendar for the customers to select and how they are restricted in selecting her for different services for the same day. Availability message is displayed above the booking field and it will give information of the availability of the product for selected booking details. 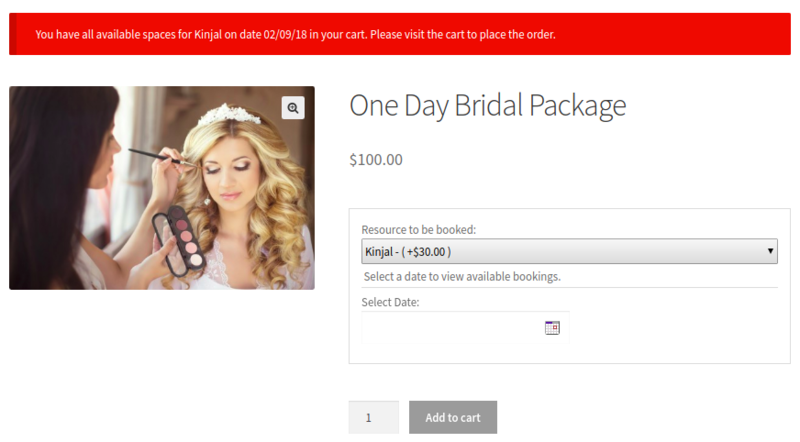 Suppose a customer has already added the booking to cart and then revisits the product page and selects the same resource and booking details, then the availability notification message will be displayed that the booking is already added in the cart. 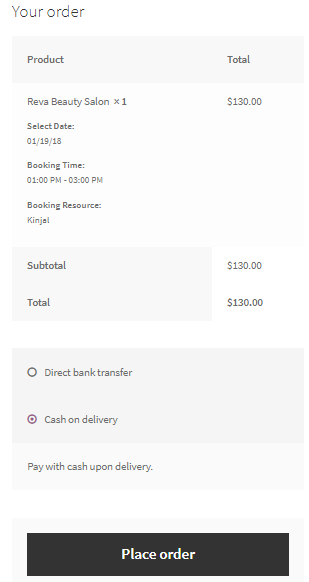 Now if some other customer comes to book the same product for Kinjal for same date 20th March, 2018, then the booking calendar will show this date disabled as the availability for Kinjal for the given date is set to 1. 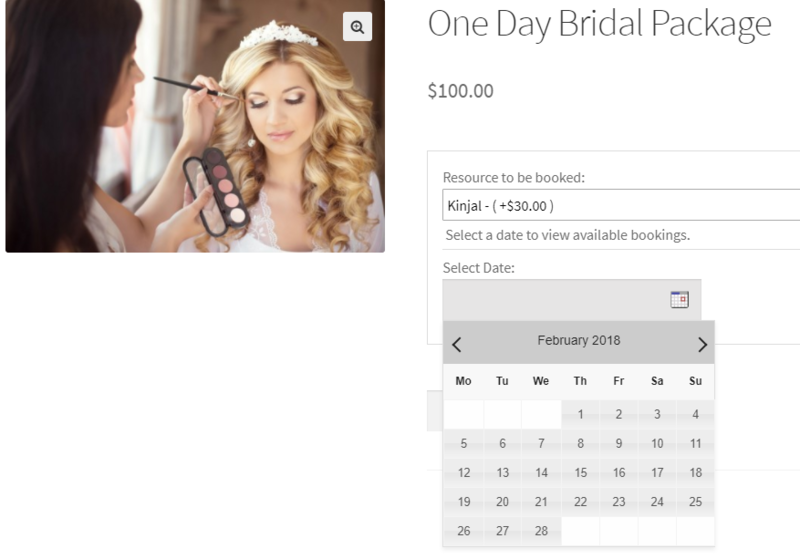 As you have noticed, 20th March 2018 is shown booked on the booking calendar because Kinjal is booked for One Day Bridal Package for the same date already. 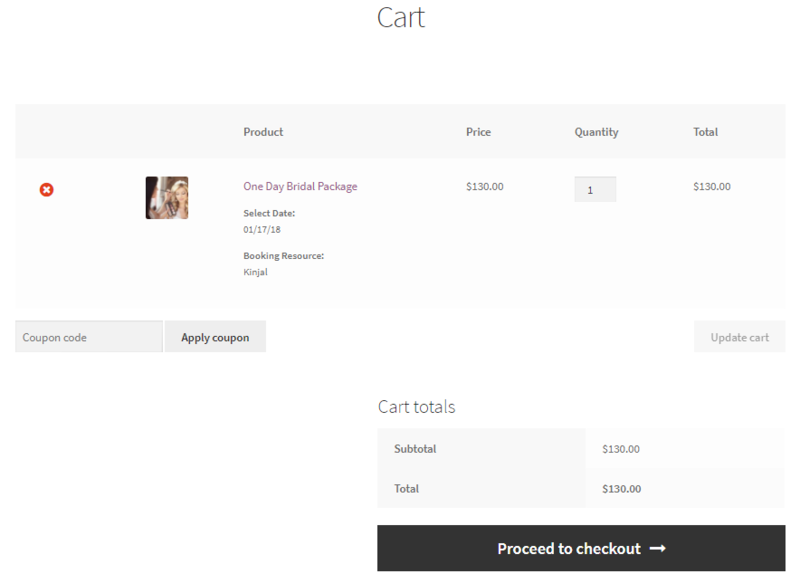 In this case, say a customer adds a particular resource and booking details for a service in the cart. Now if the same resource with different service is already present in the cart with maximum available quantity for the selected dates, then such an action should be validated. 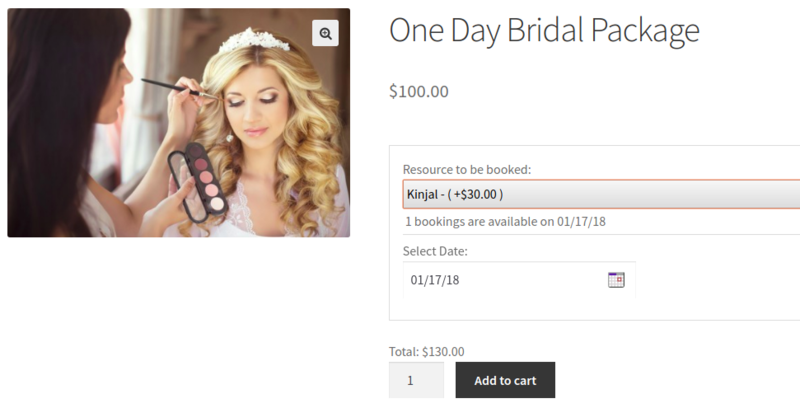 Now if you try to add One Day Bridal Package for 9th February 2018 then it will show You have all available spaces for Kinjal on date 02/09/18 in your cart. 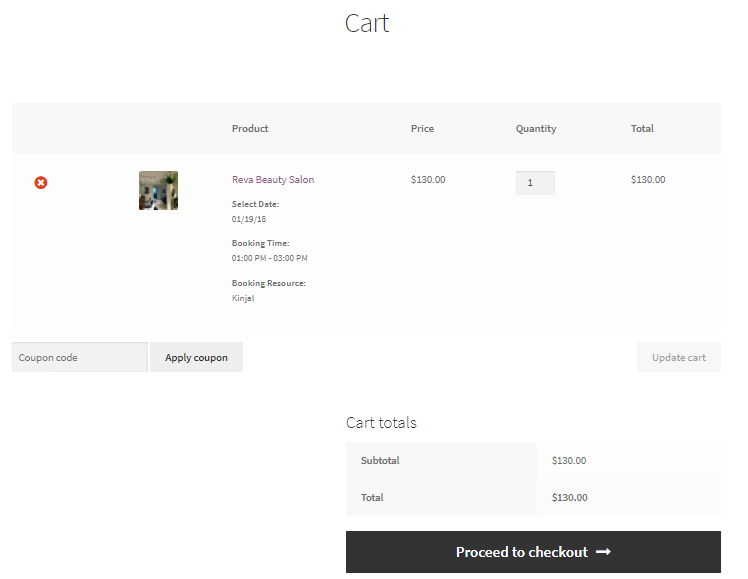 Please visit the cart to place the order error message as shown in below screenshot. As shown in the above screenshot, Kinjal is available only for 1 quantity and if the customer tries to increase the quantity more than that, then the notification message gets displayed as Kinjal can provide only 1 service for the date 02/09/18. Here you can set the total availability for the resource and also add different settings in the Range Type. As you can see there are 4 different range types, you can set her availability as per date range, months, weeks or days. 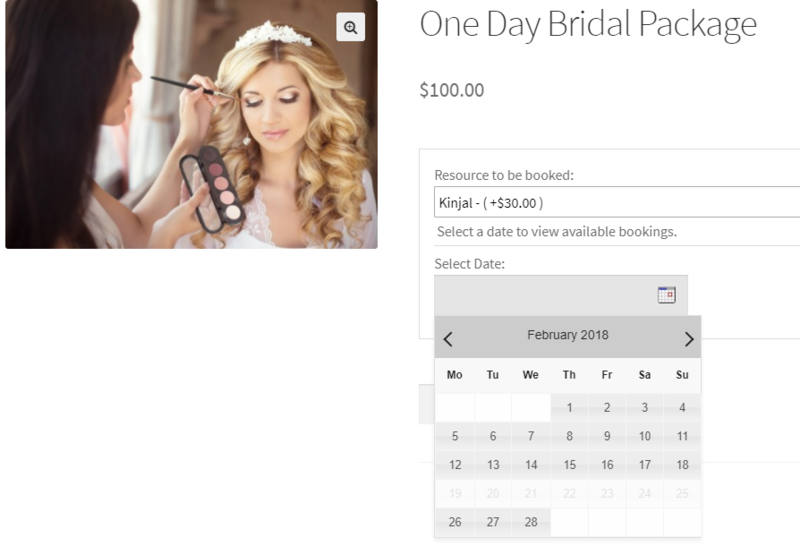 You enable the Bookable option when you want to show Kinjal’s availability and keep it disabled to show that Kinjal is not available for selected dates on the booking calendar. Thus you can add holidays for her as well as show when she will be available for the services. These resource settings will reflect on all products in the shop. Let us understand all 4 Range types with an example. We have selected the range of dates from 15th February to 18th February, 2018 when Kinjal will not be available to provide the service. Hence the bookable option is kept disabled and priority is set to 10. Let us see how this will reflect on the front end of the product on the booking calendar. As you can see above, because Kinjal was set to not provide services from 15th January to 18th January 2018, these dates are showing disabled in the booking calendar. Now let us select the Range type as Range of months and add whole months of February and March bookable for Kinjal. Also its priority is set to 9. Note: The resource setting for range type which has lowest priority set will be considered first. 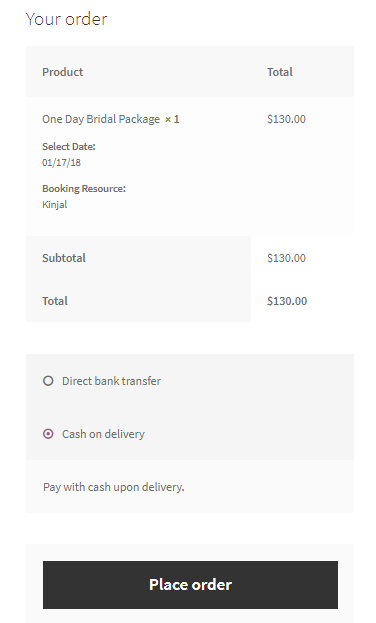 Thus, even when Kinjal was set as not available from 15th January to 18th January,2018 as per the first example, here she is shown available because of the priority settings. 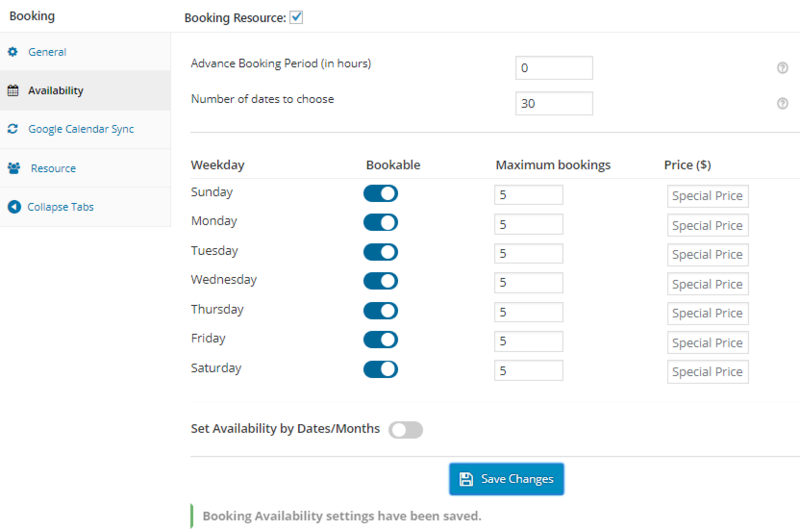 In Range of weeks, you can either assign the full week for availability or make it disabled for booking, by enabling or disabling the bookable option. Now since the priority of Range of weeks is lower than Date range and Range of months, the settings of Range of weeks will be considered. In Range of days, you can have specific days of the week set for availability or set as non-bookable. Here we have set all Tuesdays and Wednesdays unavailable for Kinjal to be booked as per the priority settings which is set to 7. Now let us check how these settings would reflect on the front end for Kinjal. The above screenshot shows that Kinjal is unavailable for all Tuesdays and Wednesdays for this service. This means despite of all other settings, Range by days was considered because its priority was set lowest than the other Range types. Thus Resources page for setting Range type plays a vital role in adding the resources availability for booking. 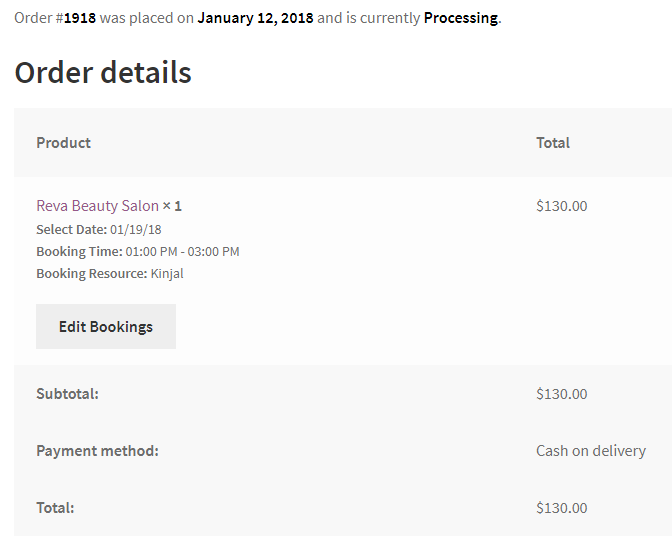 In today’s consolidated post on Resources, we explored every smallest of the settings associated with this new functionality of our Booking & Appointment Plugin for WooCommerce. This newly added feature will prove to be the best solution for businesses where they provide different services and have to manage huge resources. We have covered every aspect of service industry and keeping in mind its core requirements, have introduced this new and powerful version of Booking plugin. So why waste time lingering around the web for other solutions. Come Grab the Power today!! !